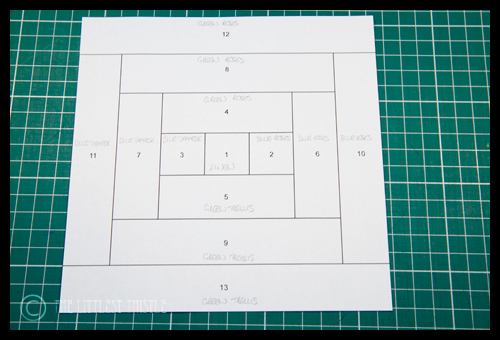 For our first block, we’re going to be creating a simple courthouse steps block, please click here for the template. I’m going to start with a couple of questions that came in the comments over the last few days to the announcement posts. 1. Annabella asked why we couldn’t just piece this block the regular old way. 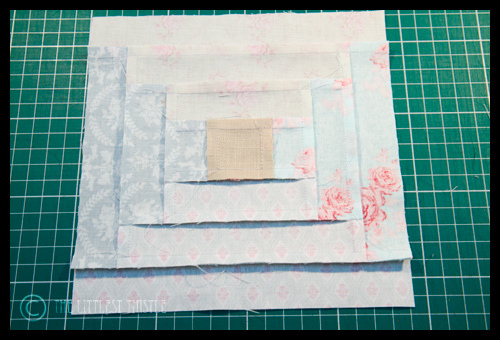 Well, we could, in fact you could piece any foundation paper piecing block the regular old way (the reverse is not true though, without introducing additional seams, as foundation paper piecing and curves and Y seams are not friends). 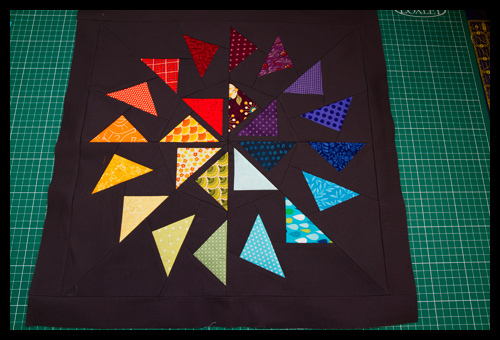 The whole point of foundation piecing is to provide you with a stable platform to work on, which is especially good for small pieces of fabric, and for odd shaped pieces of fabric. The advantage over regular piecing is that you get very precise seams, and nice sharp points. 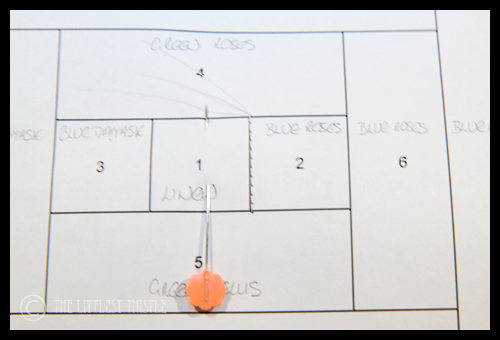 If you look at the centre square of the pattern you printed out for this week, you’ll see that it’s 1″ square – whilst not impossible to piece something that small, the chances of it shifting around a lot are high. 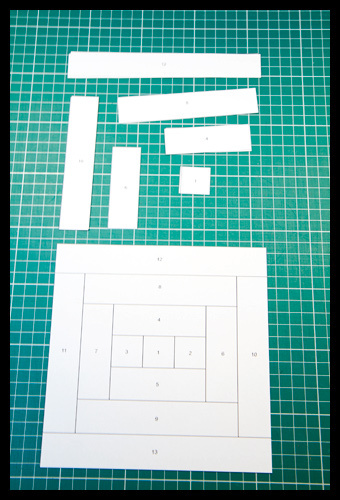 For best practice, I would suggest you print out 3 copies of the template – 1 as a reference, the 2nd as the foundation base and the 3rd as your cutting guide. As this block is all done in one go, you could probably forgo your reference version, but later down the line when we get to the complex sectional patterns, you will definitely need that reference one! For your foundation base piece, simple cut the square pattern piece out. 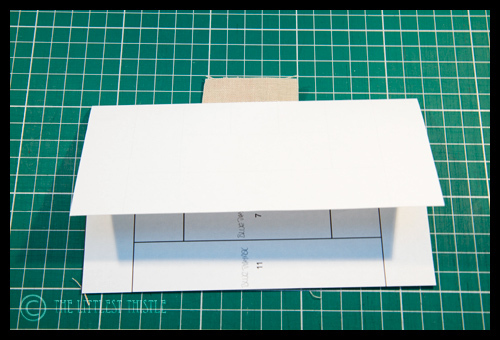 For your cutting guide, you will need to cut out each individual section – I use a craft knife and metal ruler on this part, simply for speed, but scissors will work just fine. Now grab the fabric you want to use. 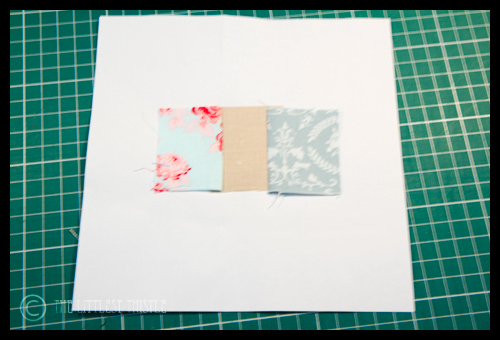 You can use scraps, but make sure that each scrap is AT LEAST 1/2″ bigger on ALL sides of the pattern piece. 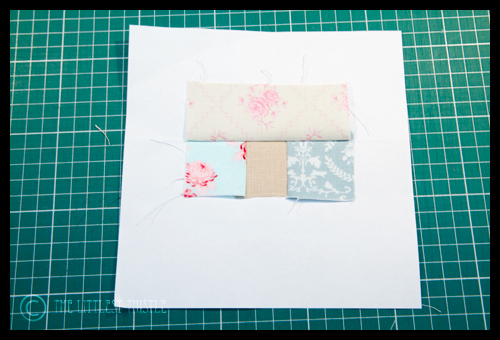 Take the cutting guide for piece one and place it on your fabric. 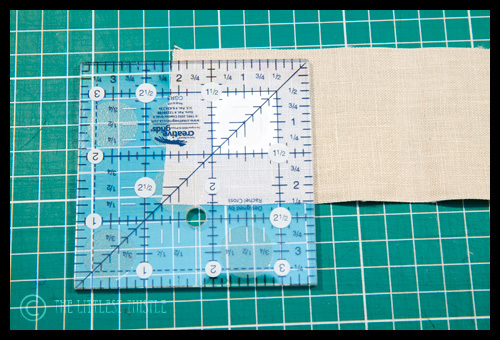 I use the handy 1/2″ line on my ruler to trim the fabric down so that it is 1/2″ larger all round. Regardless off the shape of the piece, I always do this, as I have found that grabbing a random piece that’s bigger than your pattern piece and *should* fit, as soon as you move away from a square or a rectangular pattern piece, you spend an inordinate amount of time scratching your head trying to work out how to line up your scrap with the sewing line so that the entire pattern piece is covered after it’s been sewn on, not to mention inevitably spending quality time with your seam ripper and wasting quite a bit of fabric! The reason I always use 1/2″ is that getting everything lined up when trimmed down to a 1/4″ seam allowance often leads to very short seam allowances on at least one side when stitched! After you’ve cut all the pieces, you should have something like this. 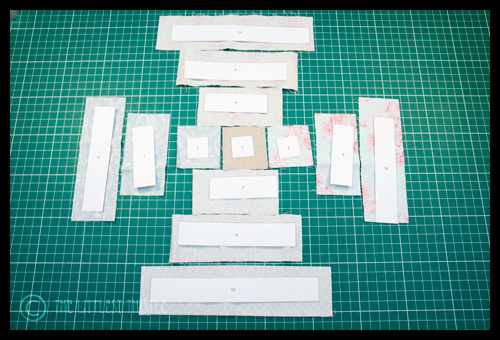 I suggest you keep the cutting guides and fabric pieces together – although in this case you have nice regular shapes, when you get to the more complex patterns with odd shaped pieces all from the same fabric, it saves a lot of head scratching if you can immediately see which piece was cut for what. 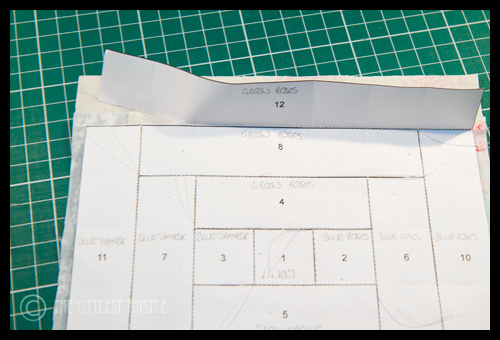 You will have noticed that all the pattern pieces are numbered – the numbers indicate the order in which you should add the fabric to build up your pattern. 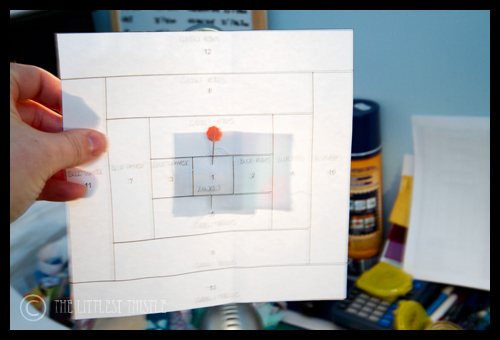 Take your foundation base pattern piece and your fabric for section 1. Holding the paper up towards a light source so that the printing is facing towards you, line the fabric up on the back so that it evenly covers section 1 on the paper, with the fabric wrong sides together with the paper – that is the right side of the fabric will be facing the light. 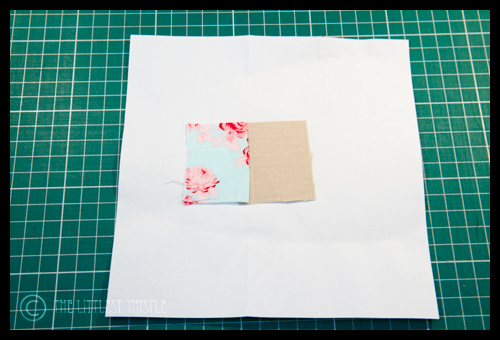 Take your paper and fabric over to your sewing machine. 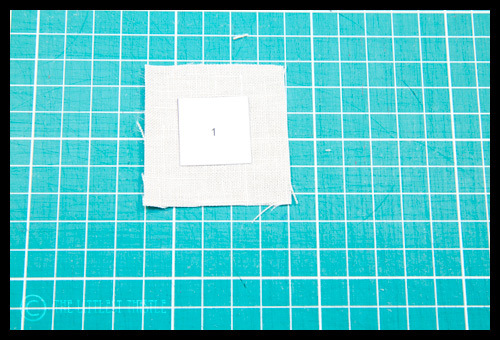 shorten your stitch length to about 1.8mm or 2mm. 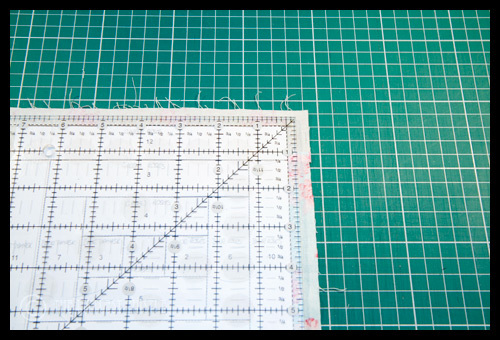 By shortening the stitch length you will make it easier to tear the paper away at the end. 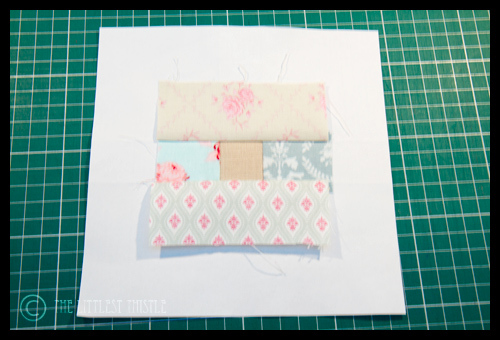 Now place the paper fabric side down with the top of the line between sections 1 and 2 under the needle. Drop the needle at the start of the line – don’t go above the line or you will cause problems for yourself when you come to add section 4. Stitch down the line, making sure you don’t go past the end of the line. Congratulations, you’ve got your first piece added, so go ahead and grab the fabric for section 3. 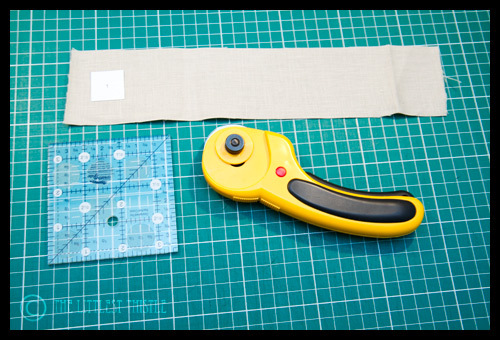 Go over to your sewing machine, and stitch in the same way as for section 2, then trim your seam allowance in the same way. 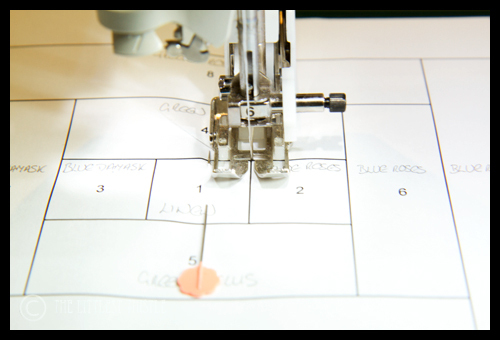 By the end of the pattern, you will notice that your paper has a whole grid of folds in it corresponding to each stitching line. Press section 3 open. Now you’ve finished building up your base for the next section. 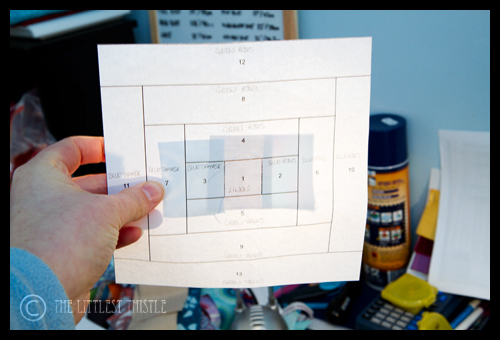 With foundation paper piecing, you’re always trying to create a base for the next section to be added on to, and in this case your 3 squares for sections 1-3 are the base for your rectangles 4 and 5. 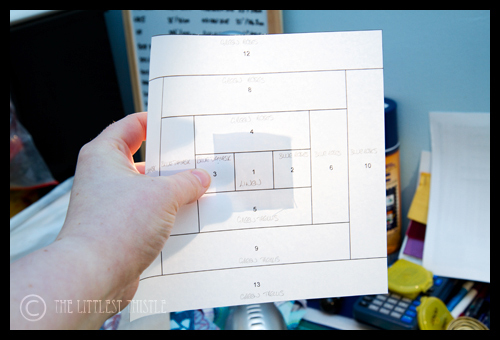 Take your section 4 rectangle, and align with your section 1-3 squares, so that the edge is parallel with the line between sections 1-3 and 4. 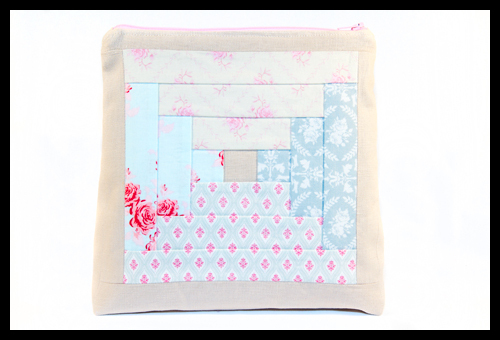 Don’t worry if your joins between sections 1 and 2 and 1 and 3 don’t leave a perfectly straight line of squares, as long as you add your section 4 piece so that the edge is parallel with the stitching line, and is about 1/2″ away, you’ll be fine. Stitch in place, trim and press open as per the previous sections. 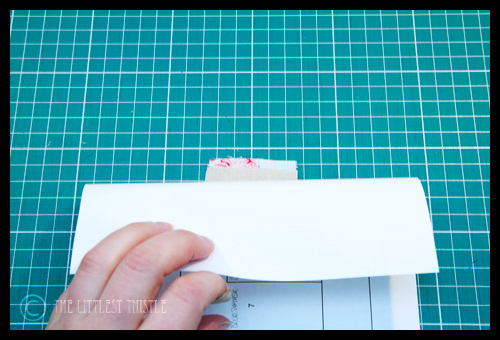 Flipping your paper over trim back your edges so that they are 1/4″ from each edge of the paper. Now the fun part, you’re going to tear all your paper pieces off! Be gentle, so that you don’t pull any stitches out, but if you shortened your stitch length then this shouldn’t be too much of a problem. This is so beautifully written – nice and clear and a great intro for the beginner. Well done! Can't wait to give it a try! This is such a clear and concise tutorial. No one could be terrified after reading this. It's just a matter of sewing those courthouse steps, step by step..
1) This is the funniest tutorial name ever. 2) I'm really glad you posted it, because I've never been able to get this type of foundation piecing. I'm pumped to give it a go! Fan-fluping-tastic – I have just made my first Courthouse Steps!!! Thank you for a brilliant tutorial. I'm going to put aside time today to make one. I've allocated pins and a needle or two for sacrificing! You need to be a teacher. It is all very clear and simple to follow. I am totally in love with paper piecing now! Thanks for such a great tutorial! Look at you Miss Teacher. This is a great tutorial. 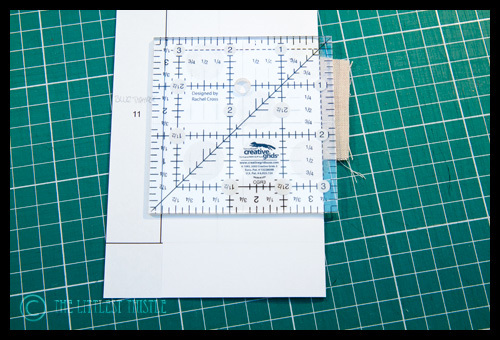 That was a great tutorial Katy – can I just recommend the Add a 1/4 ruler – it's a brilliant tool. Just finished my first ever paper-pieced block! Thanks for a great tutorial. Hi Katy, these are fab instructions. 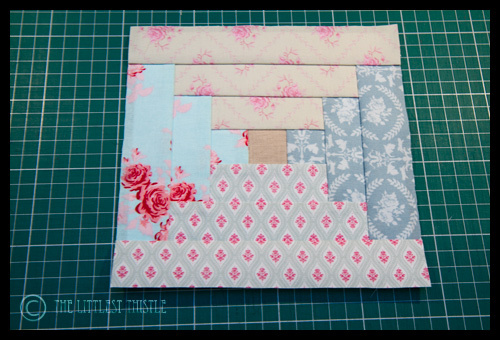 I've done paper piecing, and foundation piecing but I can see how these instructions would be fab for anyone starting. Great lesson! 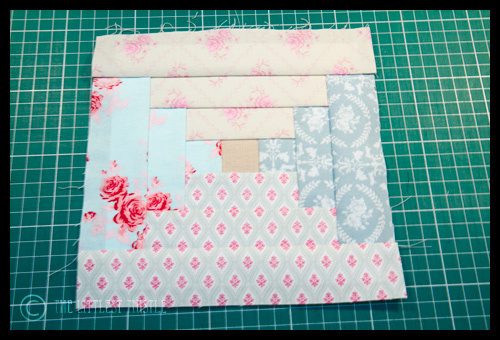 Great tutorial – this might be my next project! Thanks for posting this!! 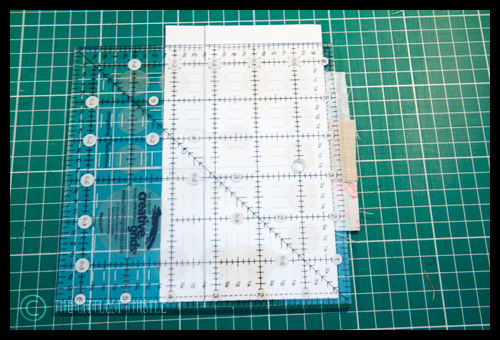 Floriani makes a great stitch and wash stabilizer in 8 1/2 x 11 sheets that are PERFECT for foundation piecing. What makes them perfect is that they will work in your inkjet printer making it super easy to make multiple copies of your pattern. No need to remove the stabilizer as it will wash away when you wash the completed item. Wow! I just stumbled across your series and I'm really excited! I can't wait to give this a go. Thank you. A bit late to the party but just wanted to say what a great tutorial Katy! Already I`m not terrified and will give this a go but will have to find a printer first as ours isn`t working. Sorry for the numptee question! How do I print out the template?? Hi DeAnna, if you click where it says 'click here' in the 3rd paragraph, that should open up the google doc, which is a PDF, and you should be able to download it and print from there.